Elizabeth Spencer is multi-talented. She does the things she loves with passion and originality. We are proud to stock two of Elizabeth’s bodies of work: mAD hATS and photographic prints. Elizabeth has always been a great knitter. 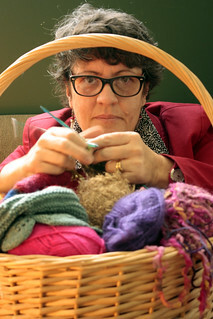 Recently, she has thrown away the instruction books, picked up colours and yarns that appeal to her & started ad-libbing. She loves all things colourful and finds inspiration all around her: it could be a tea-cup, a cake or a memory that sets the ideas and needles flying. The result is a quirky range of hand-knitted hats that you will see nowhere else: most of them are one-of-a-kind, and some can be made to order. The hats are all figments of her overactive imagination and are responsible for several sleepless nights as the designs foment in her head. Elizabeth is also an avid photographer and loves her garden. She has combined these two passions to produce stunning images of plants up close and personal. The artworks are printed in Australia using only high quality ink on either archival quality satin photo paper, or canvas using a printing process that will deliver beautiful prints which will retain their vibrancy for over 70 years! The detailed nature of Elizabeth’s photos makes them suitable for large prints to add drama and interest to a large space, as well as smaller prints for intimate spaces. The images displayed on the website are in low resolution, but be assured that the print you receive will be in glorious high resolution. The prints are posted in a sturdy cardboard tube, ready for framing. Elizabeth is wife to Kevin, and mother to three sons and two dogs. As well as knitting and photographing flowers, Elizabeth loves spending time with the men in her life, having a bunch of female friends over for tea parties, and reading theology. Her favourite colour is hot pink, and is almost never seen without wearing red.